CONSPIRACY theorists claim Usain Bolt is a secret member of the Illuminati – after he was spotted displaying occult symbols. The Jamaican sprinter was caught on camera showing off hand gestures associated with Freemasonry and Satanism at the Rio Olympics. The signs could be dismissed as a meaningless coincidence. But the Daily Star Online as unearthed footage of the “triple-triple” winner clearing wearing a Masonic ring. Bolt, 30, who has won three gold medals in three consecutive Olympic Games, is well-know for pulling poses – such as his famous “Lightning Bolt”. But when truthers started analysing some of his body language they found many of his hand gestures are associated with the occult. The fastest man ever recorded was pictured covering one eye with his palm in a gesture supposedly referring to the eye – or third eye. The “Eye of Providence” – or all seeing eye of God – is a Freemasonry sign that appears on the US dollar bill. Bolt was also seen holding up his hand to his eye in an “OK” sign. Illuminati watchers claim the thumb, index finger and middle finger form a number six and when the ring finger and little finger are separated it forms three sixes – the sign of the Devil. 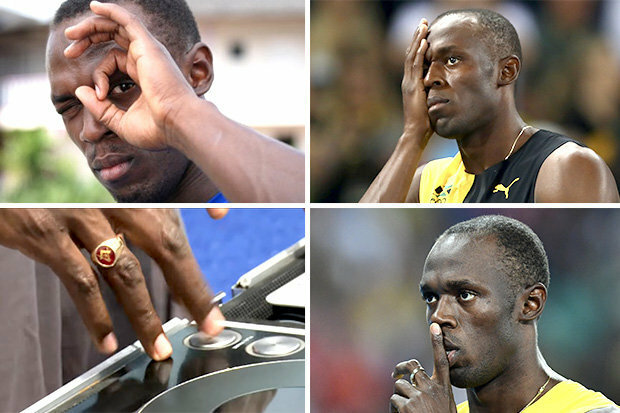 On other occasions Bolt was seen flicking the “devil’s horns” hand gesture often associated with rock music. The Olympian also held his index finger to his mouth in a “sh” gesture. Conspiracy theorists claim this is a secret society salute, showing he knows to keep quiet about what’s really going on. The tin hat brigade then started to delve deeper. They point out that Bolt ran in lane six in his 100m and 200m finals and at least one of his qualifying heats – again supposedly symbolising Satan. He did however run in lane four as he claimed his third gold of the Games in the 4x100m relay. Internet Evangelists have gone further and suggested Usain’s nickname “Lightning Bolt” itself signifies Lucifer. Of course, many sportsmen put their finger to their lips – usually mocking opposition fans by telling them to be quiet. Lots of people use “devil’s horns” hand gestures and Bolt may have been rubbing his face when he appeared to cover one eye. It seems even more far-fetched that the runner would chose his nickname or lane number to symbolise the source of all evil. However, the Daily Star Online has uncovered a video of Bolt wearing a Masonic ring. The sprinter wears a ring with the iconic square and compass in an official video for the Singapore 2010 youth Olympic Games. The man behind conspiracy Youtube channel What is Real said: “I’m simply identifying what’s right before us, right to our faces in pictures, in videos. “This is not theory, I’m not speculating and saying Usain Bolt is Illuminati. “But for whatever reason, for some weird, odd reason, he is displaying all the typical gestures of Masonry. “He is even wearing a Masonic ring – and he just happens to be the world champion, three times in a row gold medalist in the 100m and 200m. as fastest athlete your left your name in Guinness book of record before moving over to football, though you couldnt fine your career their.